Made with cream cheese, crushed OREO Cookies and instant coffee, these white chocolate-dipped Cappuccino Cookie Balls are sure to please the coffee lovers on your gift list. Add 1 tsp. coffee granules to water in medium bowl; stir until dissolved. Add cream cheese, cookie crumbs and 1-1/2 tsp. cinnamon; mix well. Shape into 48 (1-inch) balls. Crush remaining coffee granules with back of spoon; stir into melted chocolate. Dip cookie balls into melted chocolate mixture, turning to completely coat each ball; place in single layer in shallow waxed paper-lined pan. Sprinkle with remaining cinnamon. 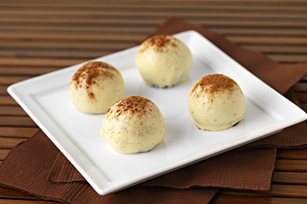 Pack these delicious cookie balls in small containers. Then, add a colorful bow and gift tag to each container and you've got the perfect holiday or hostess gift. Crushing OREO Cookies is a cinch with a rolling pin and a resealable plastic bag. Or, process the cookies in your food processor or blender. To easily coat balls with the melted chocolate, add balls, in batches, to bowl of melted chocolate. Use 2 forks to roll balls in chocolate until evenly coated. Remove balls with forks, letting excess chocolate drip back into bowl. Place balls in prepared pan; let stand until firm. Place chocolate in microwaveable bowl. Microwave on HIGH 2 min. or until chocolate is completely melted, stirring every 30 sec.